We have plenty of legends and pop culture creations about the losing side in a conflict stashing away resources to try to make a comeback in the future. Clive Cussler took stories about Confederates trying to set up a resistance/government in exile to create a story about a ship leaving with gold and papers that disappeared. Alternative history writer Turtledove wrote about a different end to WWII based on real operational documents & plans. The real operation was to create a guerilla movement to cause the allies a LOT of grief but from what I read just caused lots of German youth to be in camps or killed by Russians. They also had another plan, escaping to South America and some evidence exists for this when U-boats had to surrender in the Atlantic or Caribbean on their way south. Or to Antarctica if you listen to overnight radio. And we also find it in BTU- Star League caches as they headed off to put down Aramis have long been a very popular staple. The Star League did not stop there either, they stashed gear in hidden locations when they arrived in the Pentagon worlds. The Blakists positions caches of equipment for operations before kicking off the Jihad, the most famous IIRC one discovered by the Scorpions while they were relocating. During the Dark Age we discovered Liao had hidden mountain storehouses that let them surprise the Republic & FedSuns with new insta-regiments (instead of magic warehouses, magic mountains?) for their renewed militancy. The Marik-Stewart Commonwealth had gathered enough equipment in their own hidden cavern on Marik to equip a combined arms regiment when they faced the Lyran onslaught. The End is near for the Taurian Concordat- no matter what casualties they inflicted on the Star League, they just kept grinding forward in the Star Lord’s efforts to unite all mankind under the League’s banner. A few very senior officers who are determined to keep fighting into the future select a injured proven combat commander to be in charge of the operation supported by a staff of engineers and logistics experts. The commander is told to select a current terraforming candidate to build his hidden cache, a Horde of equipment and materials for the resistance to occupation. Besides typical insurgent equipment (small arms, explosives, mines, mortars and sensors) he is instructed to skim off heavy equipment (mechs, armor, ASF/SCs) to support larger operations and assign dropships for ferrying materials & personnel. A jumpship or two would be assigned before the final surrender when his Operation Werewolf would go live, leaving him as the most senior officer free. If you were to be the one stocking that Horde . . . what would you have wanted to put in it the Horde as the Concordat collapsed? Small Arms, ManPack SRM/LRMs, Explosives, MREs, Water Purifiers, Mini Fusion Chargers, and Batteries. Battlemechs, Suitcase Nukes, Chem/Bio Weapons, will just bring down whomever you are fighting down on you like a ton of Bricks. You will trade a Garrison for a regiment, brigade, division, and they are going to practice hunting you. 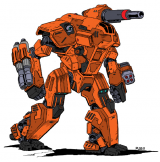 Battlemechs cannot effectively fight an insurrection without War Crimes and Wanton Civilian Damage. 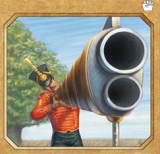 Now you may be able to play that against the occupiers for a while with the populace, however once you kill or get killed enough locals that support will evaporate. No one will be marching a Company of Mechs against the Star League and winning, and short of a DCMS/Clan Trials, 3SW battles, or way out in the Periphery, no one else will be marching a company Mechs anywhere and winning either. So stock it with standard insurgency gear that has been effective for 1000 years. Sorry, I have the inventory for small arms . . . I was asking more about what heavy equipment you would include, X mech but not Y, one type of tank over another, etc. I realize they will not be able to throw off the Star League, but the scorpion can still sting the elephant. They tried this. The result was the Alexandrite worlds, and that went fantastically. Common Mechs, Easily available parts on Black/Grey/Merc Market, at least 1 model of all were produced locally in the TC at one time, mostly not ammo dependent, except for LRMs, SRMs, and MG Ammo. All have a PPC or Large Laser, with Mediums, Ammo based weapons not Primary weapons, they have heat sinks and Armor above the standard models. Toro's. because they were built in house, and were fairly common in Taurian forces before the reunification war. would make it easy to obtain for a cache, whether you get it right from the factory or from a Taurian military unit. And would have the additional bonus effect of driving the Star League crazy when they show up years after the factory was leveled. The Toro and the Talos both. both are unique Taurian designs which the SLDF did their best to eradicate from existence. I like the Talos and Toro ideas. I'd add captured Start League machines. Something they didn't want to haven't seen during the war but was too valuable to just destroy. I'd also favor all energy, or nearly all, load outs. I agree that small arms make the most sense, realistically, but the BTU is rife with stories of 'mech units fighting guerilla actions for months at a time. Based on that, I would expect them to add to small arms with a great deal of explosives, munitions, and small-scale nuclear weapons. For battlemechs, I would expect the majority to be mobile lights and mediums since, as snewsom2997 says, nobody beats the SLDF by main force. Flashman, Black Knight; they'd probably have a few Archers to throw in because everyone has Archers out their rears. Bug 'Mechs too. Tanks, you can be more picky about; alternatively you have less selection for the era. Pick whatever you like, there, and add lots of them. One thing to consider is that this hidden Alamo is probably going to be gathering all kinds of scrap, junked whatever, and doing its best to hide. If you can get one company of good, working machines that's one thing, but if you can get two companies of junkers and spares you can take time to fix them up while staying hidden and off the books. So maybe all the battlefield salvage is getting redirected to your little bolthole, and maybe you've got a year or five to knuckle down and stay hidden - why not repair everything you can in that time? You can do almost anything in a single dropship bay, so have a few droppers go with to act as repair depots (and when the time comes to strike back, your assault unit) and just sit back and fix everything you can. Why do I suggest this? When your PCs start picking their way through it, very little might be finished and completed, but they've got tons of spare parts. What're they going to prioritize, fight over, defend, and sacrifice? These two should actually be impossible to find in a Reunification War-era or Pre-Collapse Star League cache. 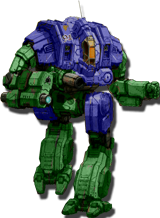 The SHD-2K was a House Kurita design created during the 1st Succession War, and the TDR-5SE was an Eridani Light Horse design after they went mercenary. Yeah, I wondered about that but did not have the Reunification RATs up . . . I was thinking maybe the -1C Primitive or the first standard materials build TBolt. As far as the Shadow Hawk, I was not sure about its timing either. One thing I would want to include is specifications for a factory to make the spare parts or new units. Make it fully automated so you don't have to worry about training and team morale issues, but include known problems just in case the person finding simply doesn't have the technology to make a fully automated plant. You might even have it where the people designing the facility start with assuming the finders have no tech base, and explain the steps to build the next set of technology. Repeat this over and over, until you get to the final step of the automated factory. The other fun is finding a database that can withstand the passage of time. Of course, finding something like this would have Holy Shroud popping up as soon as they heard about it.